I can't recall a Game of Thrones season finale that left as many characters lives hanging in the balance as Game of Thrones Season 5 Episode 10. Is Jon Snow truly dead? Did Sansa and Theon survive that jump? What will become of Arya? What's the deal with the Mountain anyway? All I can say is, it's going to be a ridiculously long ten months until Thrones returns. 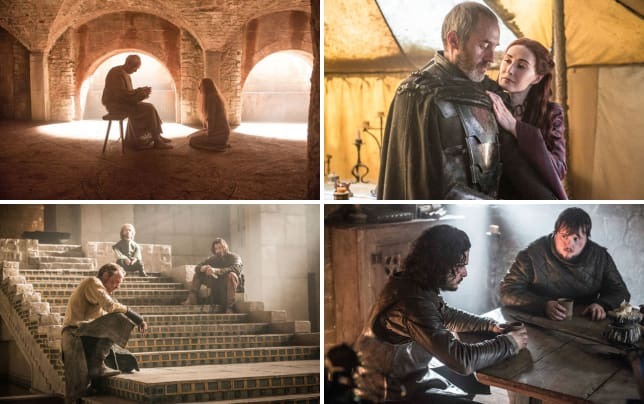 Game of Thrones Photos from "Mother's Mercy"
Though part of me was hoping Stannis' forces would take Winterfell, justice was served. I can not imagine a more perfect end for Stannis than Brienne of Tarth fulfilling her vow. As I mentioned in my Game of Thrones Season 5 Episode 9 review, after sacrificing his daughter, Stannis was "finished and not fit to rule." I was pleased to learn that half his army abandoned the so-called king and that the Boltons easily defeated those that remained. Selyse's death did not surprise me at all. How frustrating that Sansa finally lit the candle in the tower and Brienne missed it. Still, Theon coming to Sansa's aid felt long overdue. I can't imagine both of them survived that jump. Will Theon be back next season? Ramsay is going to be furious when he learns Myranda's dead. Speaking of long overdue, Brienne condemning Stannis to death was a powerful moment. Brienne: In the name of Renly of House Baratheon, first of his name, rightful King of the Andals and the First Men, Lord of the Seven Kingdoms, and Protector of the Realm. I, Brienne of Tarth, sentence you to die. Do you have any last words? Stannis: Go on, do your duty. Permalink: Do you have any last words? I thought Sam wanting to become a Maester worked perfectly for the character. There was no chance Jon would deny his friend's request. Unfortunately, that left the Lord Commander vulnerable to mutiny, but more on that later. The instant Meryn Trant appeared with three young girls before him, I knew the defiant one was Arya. I confess seeing the face of another girl surprised me for a moment, but I soon realized she had taken on another's face. Trant's death was vicious and graphic, but I've never felt more proud of Arya. The first person on her list was history, but how would Jaqen H'ghar react? Jaqen drinking the potion confused me. "Only death can pay for life," he said before dying. Then of course, Jaqen reappeared. Arya removing all the faces was visually stunning. She had been poisoned after all, but it appears only her sight was affected. Watching Jaime and Myrcella sail away so easily felt wrong. As did the kiss on the lips Ellaria planted on her before boarding. Another Lannister child down, only King Tommen to go. Jaime: My point is, we don't choose whom we love. It just well... it's beyond our control. I sound like an idiot. Myrcella: I know what you're trying to say. Jaime: No, I'm afraid you don't. Myrcella: I do. I know about you and mother. I think a part of me always knew and I'm glad. I'm glad that you are my father. Permalink: My point is, we don't choose whom we love. In Meereen, Tyrion, Daario and Jorah decided they had to track Dany down. However, Tyrion would stay behind with Missandei and Grey Worm to rule temporarily. I didn't realize how much I missed Varys until he resurfaced. The way Tyrion and Varys play off each other is fantastic. I look forward to more from them next season. Meanwhile, Daenerys was struggling with a wounded Drogon. I was curious as to why the pair didn't return to the city right away. Now we know he was too beat up to carry Dany back to Meereen. Of course, Dany wanders off and is captured by Dothraki warriors. Will they remember she was once married to Khal Drogo? Will Daario and Jorah find the ring she left behind? Though I wanted to feel sorry for Cersei, I found it difficult. She's a tough character to like. Where Jaime has redeemed himself over the seasons, his sister has not. That said, Cersei's walk of atonement was grueling to watch. It was a long sequence as well. High Sparrow: If your grace has given honest testimony, your trial will prove your innocence. Cersei: Trial? I have confessed. High Sparrow: To a single sin. Others you have denied. Your trial will separate the truth from the falsehoods. 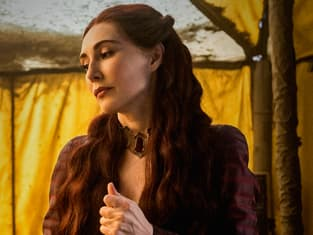 Cersei: I bow to the wisdom of your high holiness. And if I might beg for just one drop of the Mother's mercy. I haven't seen my son. I don't know how long its been. I need to see him, please. High Sparrow: You have taken the first step on the path back to righteousness. In light of this, I will permit you to return to The Red Keep. Cersei: Thank you. Thank you. High Sparrow: Mother is merciful. It is her you should thank. Permalink: You have taken the first step on the path back to righteousness. So the Mountain is now a member of the Kingsguard. He's not quite human anymore, but I imagine his task next season will be to punish/kill the High Sparrow and the rest of the Faith Militant. Finally, at Castle Black, Olly led Jon to his assassination. 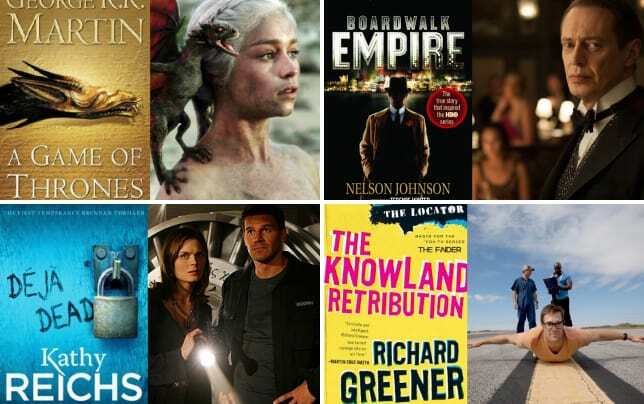 Unfortunately, these turn of events were spoiled for me by fans of the books. I find it hard to believe Jon Snow is dead, though. Jon's uncle Benjen was mentioned and my first thought was that he is the Night's King. Will he save Jon and make him a White Walker? Are we headed toward a massive battle between Ice and Fire in the final season? Jon versus Dany sounds like the way to go. What are your thoughts on this? Share them in the comments below. I've got to say, this was arguably the best season finale since the first season. Sure, it took a while to set things up this year. However, the payoff was phenomenal. The last three episodes were some of the strongest of the entire series. And now, we wait for ten months to learn the fates of our favorite characters. What did you think of "Mother's Mercy"? Who's really dead and who will be back next season? What was your favorite moment of the installment? You're up Thronies, hit the comments below. Let's talk about this insane finale. Keep an eye out for my Game of Thrones Season 5 Report Card.